When I was growing up in South Texas we had this neighbor who would, on Saturday afternoons, make her tortillas for the week. Believe me, I made friends with her children so I could make myself available for tortilla day. I think she enjoyed my enthusiasm and always had a few extra tortillas for me to take home. They were sublime! My family would fight over them, and no matter how many she sent home with me they were always gone before dinner. My mom asked for the recipe, yet no matter how my mother pleaded, or bartered with her own secret recipes, she refused to give up her recipe. Eventually we moved to North Texas and that ended my weekly tortilla gorge. It seemed I was destined to eat rubbery store-bought substitutes for the rest of my life. I survived on them until a few years ago when I was reminded, quite by accident at a local Tex-Mex place, of our neighbor and her delicious tortillas. I watched as the woman behind the counter rolled and cooked beautiful tortillas and I thought, why couldn’t I do that too? I had quite a bit of culinary know-how, and I had the internet which would surely hold the key to delicious tortillas, right? I tested a number of recipes for tortillas with all manner of ingredients. Some had vegetable oil, others butter, and some had vegetable shortening. They used a variety of flours from regular all-purpose to bread flour to even cake flour. Some used milk, others water. None of them turned out the way I wanted. I discovered pretty early that all-purpose was the flour to use. It developed a moderate amount of gluten so the tortillas were chewy but not tough. The liquid I had the most success with was milk. Water works fine, but the cooked tortillas are not as soft as when you use milk. As for fat, that was more tricky. Butter burned too easily and the vegetable oil gave the tortillas an odd texture. Vegetable shortening left the tortillas with an almost fishy smell, which happens when the shortening gets too hot. I despaired that I would never find what I was looking for when, while looking at the shortening shelf at the grocery store, I remembered one thing from the Saturday’s at my neighbors. Manteca!! That is lard to be specific. So, with my tub of lard in hand, I went back to the kitchen and tried one of the more successful recipes with the lard and … EUREKA! I had it. Now, this is the point where I am supposed to be sorry that I like lard, that I know it is supposed to be evil, and gross, and made from animals. I’m not. No, I am PROUD to say I cook with lard. 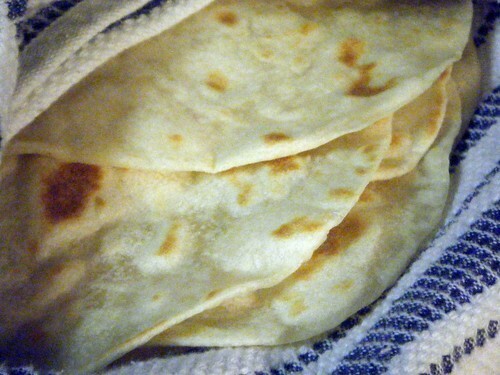 Using lard I can make tortillas that make people beg. Some have offered me cash to make them a batch. I’m not kidding. Lard adds a depth of flavor with out any funky aftertaste. It has a high smoke point so it does not scorch, and it lasts for a really long time in the pantry. It is also versatile. I use it combined with butter in my pie crusts. But that is an entry for another day. Combine the dry ingredients in a bowl. Transfer to the bowl of a stand mixer. Add the lard and mix until it is well combined and the mixture looks grainy. Add the warm milk and mix until a smooth ball of dough forms, about 5 minutes. Divide the dough into 12 equal pieces and roll the pieces into balls. Once rested, roll the balls of dough into 6″ to 7″ tortillas. Cook on a griddle, or in a heavy pan, over medium heat until golden brown and puffy. Transfer to a plate and cover with a towel while the rest cook. Enjoy! Or, allow them to cool and store them in a plastic bag in the fridge. They last for five days … if you can keep from eating them hot off the griddle.